Located along Rue Bahia Bab in the Mellah district of the Marrakech Medina is the Bahia Palace, a stunning set of tranquil gardens enclosed within the beautifully decorated walled pavilions. Bou Ahmed, a former slave who rose to a position of power under sultans Moulay Hassam and Abd Aziz, built the palace in the last years of the 19th century in an attempt to outshine any other building in Marrakech. One could argue that this project was a success. Indeed, the Bahia Palace, meaning ‘brilliance, certainly lives up to it’s name: sunlight shines through the wrought-iron windows casting beautiful shadows on the traditional Zellij tiles, while, in the courtyard, fresh orange trees and shaded gardens surround a trickling fountain. Legend has it that Bou Ahmed was so unpopular that upon his death his palace was looted and his possessions stolen. Although they were briefly used during French occupation, the palace’s cavernous rooms still lie practically empty today, accentuating the beauty of the architecture and space. The Bahia Palace offers both a serene oasis in the heart of the Medina and a fascinating glimpse into the history of the kingdom of Morocco, all just a short walk from the Jemaa el-Fna square. A definite must visit. 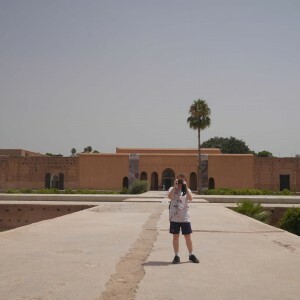 This entry was posted on Sunday, December 14th, 2014 at 9:50 pm	and is filed under Cultural & Geographical, Marrakech, Marrakech Tourist Attractions. You can follow any responses to this entry through the RSS 2.0 feed. Both comments and pings are currently closed.